RECIPES AND TABLESCAPES FOR ALL OCCASIONS… BECAUSE EVERY DAY IS A CELEBRATION! (Click PHOTO to enlarge and then back arrow to return to original size). 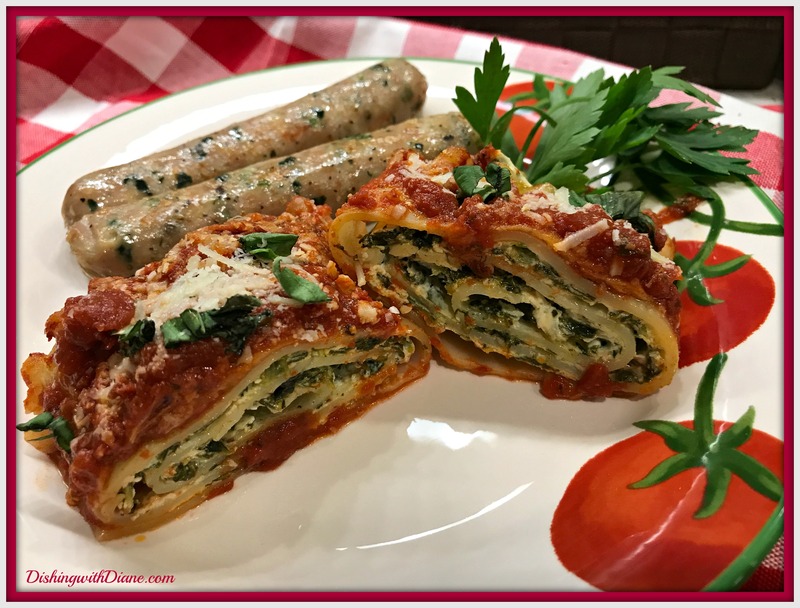 Here is another recipe that has been requested from DishingwithDiane’s Instagram page. In the photo above, I sliced the roll ups in half and paired it with grilled chicken sausage that was made with spinach and garlic and served this for lunch. A side salad can be added. For lunch or a buffet table, I slice the roll up in half. I think it makes a nicer presentation to see the filling. For dinner, I serve the entire roll up which is one lasagna noodle and an additional vegetable or protein. Give the recipe a try and let me know what you think. Until my next post, make every day a celebration! Also, continue to send me your comments, I love hearing from you. 1 jar (24 ounces) meatless pasta sauce OR HOMEMADE SAUCE. (I used my own marinara sauce). Preheat oven to 375°. Cook and drain noodles according to package directions. Meanwhile, mix eggs, spinach, cheeses and seasonings. Pour 1 cup pasta sauce into an ungreased 13×9-in. baking dish. Spread 1/3 cup cheese mixture over each noodle; roll up and place over sauce, seam side down. Top with remaining sauce. Bake, covered, 20 minutes. Uncover; bake until heated through, 5-10 minutes. Yield: 6 servings. I topped the roll ups with grated cheese. This entry was posted in Macaroni Dishes on September 20, 2017 by aries041158.